The best flywheel for the 6 speed swap. It is 11.9 pounds and accepts the 225mm clutch of the KA 240SX. This gives you the ability to run a wide variety of clutches that will hold more power and be more driveable because of the increase in disc surface area. No grinding is required to fit. It is aluminum with a replaceable friction surface ala JWT, Fidanza and SPEC. 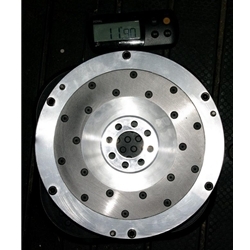 OEM flywheel weighs 23.65#, and the JWT weighs 14.45.